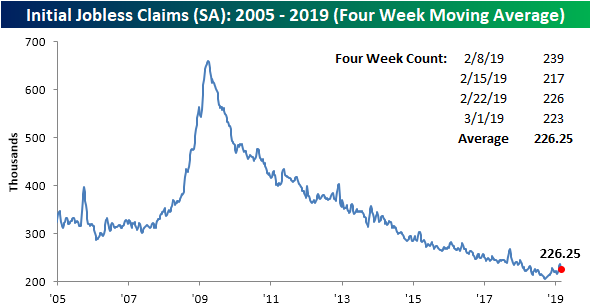 After a string of semi-concerning prints, this morning’s release of the Department of Labor’s weekly Initial Jobless Claims is offering a sigh of relief coming in below forecasts and below last week’s reading. On a seasonally adjusted basis, claims came in at 223K. That is 2K below estimates of 225K and below last week’s revised 226K. At 223K, the indicator still remains in the dead middle of the range it has been in for the past few months. 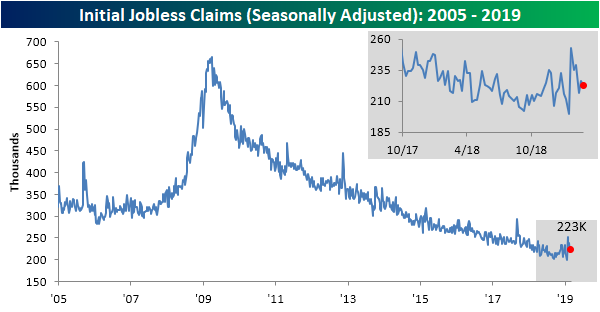 While there has not been progress in claims-making moves to new lows for some time now, by this account the labor market still appears to be healthy. 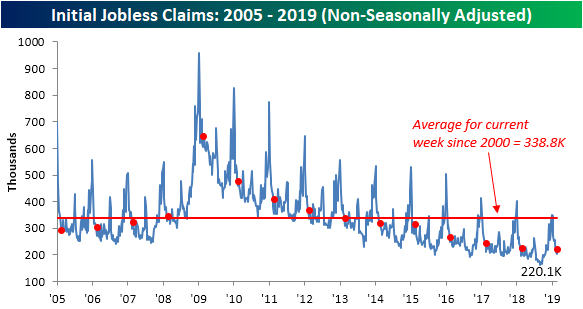 The streak of claims coming in under 300K has now grown to 209 consecutive weeks. The four-week moving average for jobless claims also fell this week to 226.25K from 229.25K last week. It has now been two weeks since the indicator last saw a 52-week high. If that trend keeps up it will certainly be a reassuring sign that the labor market is not changing course. Looking ahead to next week, with a high of 239K coming off, another print consistent with the past few weeks would lead the average lower. Finally, turning to the non-seasonally adjusted data, claims rose this week to 203.1K. That 17K increase from last week is right in line with seasonal patterns. The NSA number also came in well below the average for the current week of the year since 2000, 338.8K, and as the lowest reading for the week of the current cycle.